A solar energy representative on Monday welcomed state action to pay some of the more than 15,000 in applications that have been filed for solar energy rebates. The Florida Solar Energy Incentives Program, which began in 2006, paid up to $20,000 for solar electric panels on Florida homes. But the program has received no money from the Legislature since 2008 and expired under state law on June 30. The backlog of $52 million in requested rebates continues to increase as applications for work done before June 30 are received. On Friday, the Florida Energy and Climate Commission agreed to use $13.9 million in federal stimulus dollars to pay for some of that backlog. The U.S. Department of Energy approved using the federal stimulus money, said Rob Vickers, director of the Governor’s Energy Office. The DOE inspector general in July criticized the federal agency for approving Florida’s use of stimulus dollars for work done before Congress approved the American Recovery and Reinvestment Act in February 2009. Those applications that will be paid with the new money were received after June 2009. Vickers said his office would continue to seek additional funding for the rebate program as it becomes available. 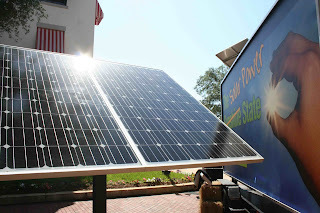 Some solar energy advocates say the state owes money to those who paid for solar devices and then applied for the rebates, but the state says the payments depended on the availability of money for the program. Using the $13.9 million is a good start towards paying down the rebate backlog, said Bruce Kershner, executive director of the Florida Solar Energy Industries Association. “I think people made the commitment to renewable energy and the state needs to figure out a way to pay them,” he said.